Today's creation was made for the OWH ODBD April challenge which is to make a masculine card. I'm using some beautiful metallic papers from the Paper Co. in gunmetal and pewter colors. The photo didn't capture the subtle shimmer, but it's just elegant. I embossed the grey panel with a CB ef, and the narrow strip was done with with one of those strip ef's in my stash. The sentiment is from MFP, done in basic grey, and the bird was done with an IO sea birds set in white. This was very quick and easy to put together so I'm making a few more for my next OWH box. If there are 50 entries in this challenge, ODBD will donate the shipping costs for 2 boxes of cards to our heroes, so I always make sure to enter a card every month. Thanks for stopping by and make it a great weekend! The gloomies are finally gone here in PA today and the sun is shining again. Yay!! Very nice! Love that bird. And thanks for the reminder on the ODBD challenge. I hope to make one this weekend. Oh this is so fabulous, love it. Sorry I'm backed up with comments. Trying very hard to get into some sort of good health and shape so I've been spending hours that the YMCA again. This card is such a classy card and any father would love and appreciate it very much. The HM card and the Butterfly cards are just gorgeous. I think the teal and purple look great together. I wish the heck I could smell some lilacs right now. I love them so much. Well I'm heading back outside to work in the yard, finally. Hope you have a good day. Beautiful way to use that sea gull! Love this masculine card Carol. SO GLAD you've got some sunshine too. That always makes the day better. Hi carol what a great card love the colours too! This is a fabulous man card Carol, so elegant. I love the embossing folder you used. Glad you had some sunshine, we have had quite a lot here this week and although it is not hot it is pleasantly warm. I have shed shoes and socks this week too in favour of sandals.Yay!!. 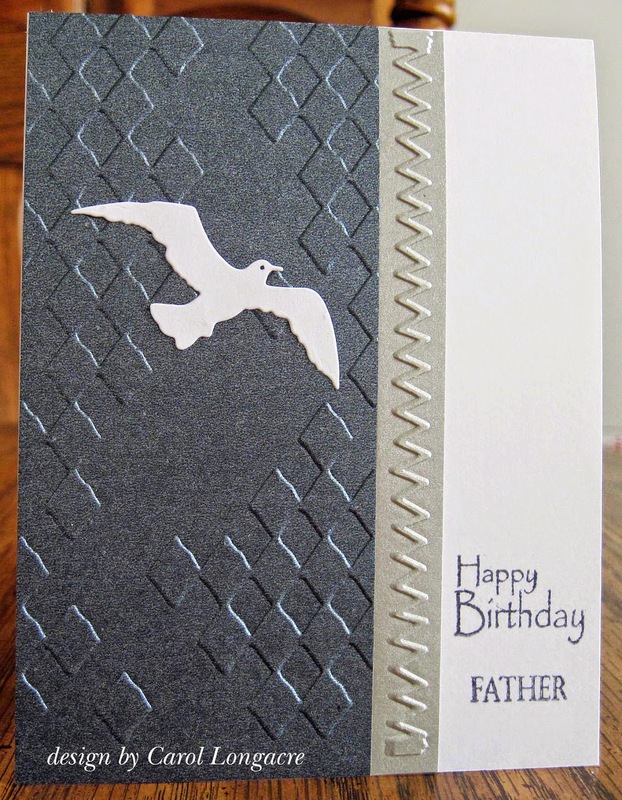 Very elegant masculine card, the embossing on metallic paper is gorgous and love so much this seagull!! This is a very elegant male card. I love the sea gull image. Wonderfully made masculine card! Like the paper you used! Yes, I so enjoyed seeing that beautiful sunshine today! So perfectly masculine! I love the embossing! Fabulous masculine card. Love the colours you chose, as well as all that wonderful texture on the embossing.